Founded in 1990, Wisconsin-based Excel Engineering is a full-service design firm with more than 140 professional architects, engineers and associates. Repeat business, client referrals and a reputation for superior plans have grown the company to over $600 million in construction annually. With the growing popularity of cold-formed steel, it’s become one of the fastest growing segments of the business at Excel Engineering. In recent years, the firm has become a leader in prefabricated cold-formed steel panel design and had the opportunity to take on increasingly larger projects such as multi-story hotels, condo complexes and nursing homes. 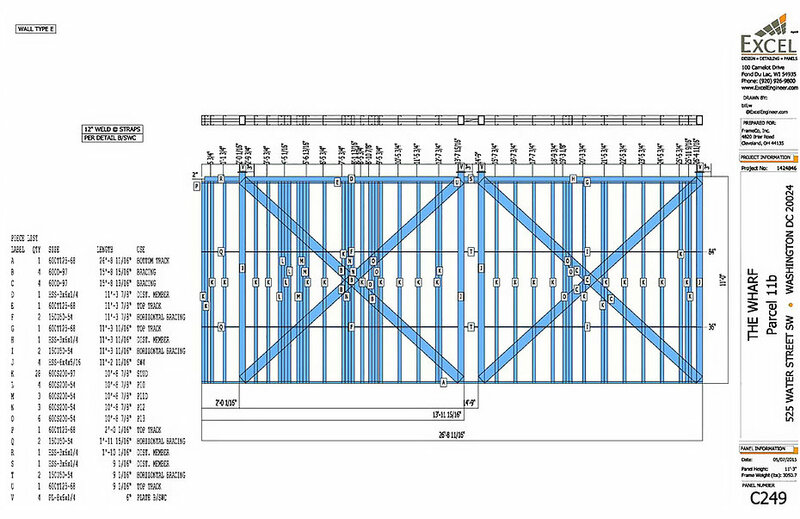 After looking at several software solutions for panel fabrication, Excel brought in Vertex BD, a flexible building design tool that automates creation of architectural and structural drawing sets, fabrication drawings, material reports, manufacturing data, and architectural visualizations – all from one building model. In fact, as Excel adds to its cold-formed steel team, the firm finds it quick to train new members on Vertex BD. With a couple of hours of instruction, designers know how to use most features. Over the years, Excel has had the opportunity to provide input on the software functionality, which has expanded significantly with customer suggestions. With new cold-formed steel products coming out regularly, Excel appreciates the ability to create a custom library in Vertex BD that houses the many shapes and numbers. And with the newly added ability to split the modeling window into two monitors, designers can see the full design at once. “We can have our plan on the left side and customizable shapes for that job on the right and just drag and drop,” says Bill Wilde, Senior Technician. HIGHER VALUE OUTPUT – FASTER. With design automation using Vertex BD, Excel’s engineers complete designs two to three times faster with more accuracy and double the amount of information for clients. BETTER CUSTOMER SERVICE. More information and greater accuracy mean fewer hiccups in the field so that construction typically progresses smoothly, reducing calls to Excel after delivery to clients. “The customer service at Argos is really good. They’re very quick to respond, which keeps us productive and on schedule,” says Bill Wilde, Senior Technician. INCREASED CLIENT SATISFACTION. “We’re winning work because clients have faith in what we’re producing. The software allows us to get the job done in a reasonable timeframe and put a lot of information in clients’ hands that they may not get with other programs,” Scherzer adds. EASY TO USE, POWERFUL CAPABILITIES. “Vertex BD is the most well-thought-out program we’ve seen. It’s complex enough to handle different conditions, but simple enough so that you can’t get lost. It’s intuitive to use compared to other programs,” says Kristopher Kitowski, Senior Technician. EASY TO TRAIN. As Excel adds to its cold-formed steel team, new designers know how to use most Vertex BD features after only a couple of hours of instruction. LARGER, COMPLEX PROJECTS. Excel has used Vertex BD to design some of its biggest projects, including the five-story DoubleTree Hotel in Evansville, IN, and The Wharf, a mile-long waterfront neighbourhood in Washington, DC, that includes retail, residential, hospitality, offices, a public park and piers. “Without Vertex BD we would not land the size and scope of the projects we get,” Scherzer says. 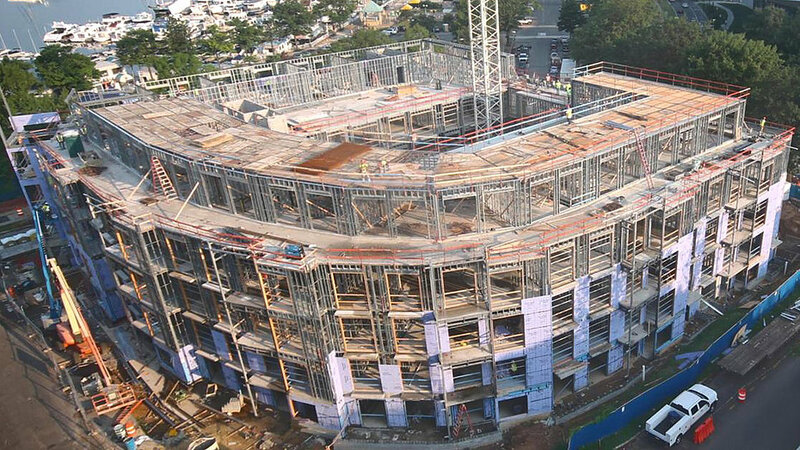 Most of the Wharf project consisted of load-bearing cold-formed steel framing.Vertex BD helped the Excel team design the challenging aspects of the condo complex such as curved walls and posts with beam pockets, MEP (mechanical, electrical and plumbing services) sleeves, and shear wall posts, all on an aggressive construction schedule.